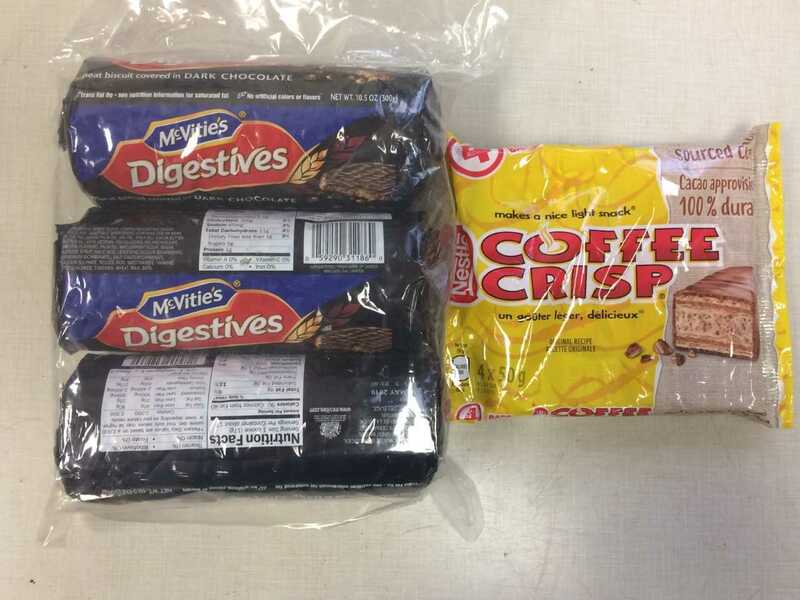 McVitie’s Dark Chocolate Digestive Biscuits happen to be my favorite among all “cookies,” as we Yanks call them, and Coffee Crisp, unobtainable at U.S. stores, is a Canadian candy bar of impeccable flavor and lineage. I don’t know who sent these, and perhaps I was told and forgot, but many thanks to the super-kindly sender, and email me if you’re the one. This entry was written by whyevolutionistrue and posted on December 21, 2018 at 11:30 am and filed under food. Bookmark the permalink. Follow any comments here with the RSS feed for this post. Both comments and trackbacks are currently closed. Bravo! McVities are hugely popular over here, especially the ones you dip in your tea. Well. The digestive’s are my favourite too but I was amazed about the coffee crisp. I am 65. When I was young in the 60’s coffee crisps appeared in Britain and I loved them. They still exist! I wish the canucks would start exporting them to us again. I buy Weetabix often at Trader Joe’s. I was also surprised when I discovered it a few years back. A box is surprisingly cheap – $2 if I remember correctly. Way cheaper than at British import shops. It’s actually made in Canada but they have a US website, http://www.wheetabixusa.com. There’s an errant “h” in that URL… I got it to work at “www.weetabixusa.com” but the url only tells me to look at Amazon Prime (which doesn’t have it) and at a local store (not Trader Joe’s) which also doesn’t have it. We have bought them at TJs in California, Tennessee, and Illinois, so I don’t think location should be an issue. A trip to a nearby Trader Joe’s yielded an ample supply. Many thanks for the pointer! Sorry about the URL. I live in Long Beach, California. I live halfway between two TJs and both have Weetabix (no ‘h’). I tried to buy Weetabix in Milan 20 years ago. The lady asked what it was (in Italian). She said no, but that they had another similar thing and showed me a packet of Weetabix. She called it like ‘Vay-ta-bix’ compared to my ‘Oo-ee-ta-bix’. The difference was enough not to be understood. My favourite biscuit is the Chocolate Oliver, ridiculously expensive and hard to get. These days, the only chocolate I have comes from here. I was there today, in fact and if you get the chance I recommend it. If ever you fancy a change from H&P’s I highly recommend FOX’S GOLDEN CRUNCH CREAMS first & their ginger version second. They are also marvellously cheap so it’s worth a punt to buy them blind. I liked the original Chocolate Oliver before the company went bust a decade ago. The resurrected Huntley & Palmers biscuit has less biscuit & more chocolate – sounds good many might think, but the balance has been lost. No longer a biscuit for nibbling alongside tea/coffee IMO. I also object to buying the souvenir tin each time when there’s only 14? 15? biscuits in the bloody thing – no biscuits only option is a scandal. I suspect they ‘make to order’ & cash flow ain’t great [supermarkets want 90 days or even 120 days credit] thus OOS too often. I notice biscuit makers have ‘pivoted’ [as they say now] to dark chocolate, but most of them strangely have just replaced the milk choc with the same quantity of dark choc – this is stupidity when actually it’s necessary to revaluate all the biscuit components if any one component is changed. Down with biscuit tin madness! Coynezaa hasn’t even begun and you already have two splendid gifts: an origami duck and snacks! Indeed! I am a happy boy! Mmmmmm Coffee Crisp is my favourite chocolate bar. I love any candy with coffee flavoring (and ice-cream) so I’d love these. Very surprised they can’t be found in the US. I can’t even think of a “chocolate bar” sold here that has a coffee component. Just hard candies, and small chocolates you’ll find in a See’s candy box. It’s so weird that you can’t get ‘Coffee Crisp’ in the U.S. But then, we can’t get ‘Heath Bars’ up here. They are my favourite chocolate bar, and I have to stock up when I go to the States. The best chocolate that I have ever had is the Stilwell’s easter eggs we got as kids. Sadly, Stilwell’s doesn’t make chocolate anymore, just humbugs (another of Jerry’s favourite things). I have never tasted any chocolate to match it. Granted, I haven’t tasted all chocolate in the world, but I have given it a good try! Whitaker’s Chocolate in NZ is good as are Smarties from anywhere but Canada. They put artificial flavour in Smarties here while in NZ and Australia (and I assume England) they don’t and they taste way better. Though I think Canada is headed that way so maybe they are better now. Ya, I can’t eat Smarties. They just taste like chemicals to me. But, I haven’t tried them in a long time, so maybe they’re changed. Try Whittaker’s. You can usually find it in some shops or online in Canada. Please be careful. I’m surprised nobody has already pointed out the obvious: these may not be from a friend, and they may be tainted or poisoned. There are a lot of crazy people out there. If I were you, I would throw them out uneaten unless someone you know and trust comes forward to take credit.